Commission Regulation (EC) No 1249/96 of 28 June 1996 on rules of application (cereal sector import duties) for Council Regulation (EEC) No 1766/92 (2) has been substantially amended several times (3). In the interests of clarity and rationality the said Regulation should be codified. Article 135 of Regulation (EC) No 1234/2007 provides for the common customs tariff duties to be charged when the products referred to in Article 1 thereof are imported. However, for the products referred to in Article 136(1) of that Regulation, the import duty is to be the intervention price valid for these products at the time of importation, increased by 55 % and then reduced by the cif import price applicable to the consignment. For the purposes of grading imported products, the products referred to in Article 136(1) of Regulation (EC) No 1234/2007 are, in certain cases, to be classed in several standard qualities. The standard qualities to be used should therefore be determined using objective grading criteria and tolerance rates should also be set allowing products to be given the most appropriate quality grading. Of the possible objective quality grading criteria for common wheat, protein content, specific weight and miscellaneous impurity (Schwarzbesatz) content are those most commonly used in the trade and also the easiest to use. For durum wheat, these criteria are specific weight, miscellaneous impurity (Schwarzbesatz) content and vitreous grain content. Imported goods are accordingly to be subjected to analysis to determine these parameters for each lot imported. However, where the Union has established an official recognition procedure for quality certificates issued by an authority of the country of origin of the goods, these analyses should be able to be carried out merely by way of verification on a sufficiently representative number of imported lots. Article 136(2) of Regulation (EC) No 1234/2007 provides that for the purposes of calculating the import duty, representative cif import prices are to be established on a regular basis for the products referred to in paragraph 1 of that Article. For the establishment of these prices, the use must be stipulated of quotations for the several wheat qualities and for the other cereals. The actual quotation sources to be used should be specified. The use of quotations for the various wheat types and for other cereals on the commodity exchanges of the United States of America will provide a basis both transparent and objective for establishing representative cif import prices. The addition of the commercial premium assigned on the United States market to each quality of the various cereals will allow the exchange quotation for each cereal to be converted into a fob export price from the United States of America. By the addition of sea freight costs between the Gulf of Mexico or the Great Lakes and a port of the Union that are quoted on the freight markets, these fob prices can be converted into representative cif import prices. Given the volume of freight passing through and the amount of trade at the port of Rotterdam, this port is the destination in the Union for which sea freight quotations are most widely known, most transparent and most easily available. The port of destination to be selected for the Union should therefore be Rotterdam. Accordingly, for the sake of transparency, the representative cif import prices referred to in Article 136(2) of Regulation (EC) No 1234/2007, are to be established from commodity exchange quotations for the cereal in question plus the commercial premium assigned to the cereal and sea freight costs between the Gulf of Mexico or the Great Lakes and the port of Rotterdam. However, freight cost differences by port of destination justify flat rate adjustment of the import duty for Union ports located on the Mediterranean and on the Black Sea, on the Atlantic coast of the Iberian Peninsula, in the United Kingdom and in Ireland, in the Nordic countries, in the Baltic States and in Poland. The factors of calculation of the representative cif import prices so established should be monitored daily so that the trend of these prices can be followed. In the case of sorghum and rye, the representative cif import price calculated for barley allows the market situation for those two products to be estimated and consequently the representative cif import price determined for barley applies for these cereals. For the purpose of setting the import duty on the cereals referred to in Article 136 of Regulation (EC) No 1234/2007 a period of 10 working days recording of the representative cif import prices for each cereal will reflect market trends without introducing uncertainty. Import duties for these products can therefore be determined on the fifteenth day and the last working day of each month using the average representative cif import price recorded over that period. The import duty thus calculated can be applied for two weeks without any appreciable distorting effect on the duty paid import price. However, if no exchange quotation is available during the calculation period for the representative cif import prices or if as a result of sudden changes in the components of the calculation of import duty they fluctuate very substantially during the period of calculation, action must be taken to maintain a properly representative price for the product in question. In the case of large fluctuations in either the exchange quotation, the commercial premiums attached to the quotation, the sea freight costs or the rate of exchange used to calculate the representative cif import price of the product, the price used for calculation of the import duty should be kept representative by means of an adjustment corresponding to the deviation from it that these changes account for. Even where this type of adjustment is made, the timing of the next determination need not be affected. In the case of imports of flint maize, the exchange quotation used for calculation of the representative cif import price may not, either because of the particular quality of the goods or because their price includes a quality premium over the normal price, take account of the existence of such a premium over normal market terms. To take account of that quality premium over prices or quotations importers who show that they have used the goods to make high quality products justifying the existence of such a premium should be reimbursed, at a flat rate, part of the import duty paid. In order to ensure that importers respect the provisions of this Regulation security should be required from them additional to that pertaining to licences. The Common Customs Tariff duty rates referred to in Article 135 and Article 136(1) of Regulation (EC) No 1234/2007 shall be those applicable on the date stipulated by Article 67 of Council Regulation (EEC) No 2913/92 (4). 1. The import duties referred to in Article 136(1) of Regulation (EC) No 1234/2007 on products of CN codes 1001 10 00, 1001 90 91, ex 1001 90 99 (high quality common wheat), 1002 00 00, 1005 10 90, 1005 90 00 and 1007 00 90 other than hybrid for sowing, shall be calculated daily but fixed on the 15 and the last working day of each month by the Commission for application respectively from the 16 of the month and the first day of the following month. Where the 15 is not a Commission working day, the duties shall be fixed on the working day preceding the 15 of the month in question. However, if during the period of application of the duties thus fixed the average import duty calculated differs by EUR 5 per tonne or more from that fixed, the corresponding adjustment shall be made. 2. The price to be used for the calculation of the import duty shall be the daily cif representative import price determined as specified in Article 5. For each fixing, the import duty considered shall be the average of import duties calculated during the previous 10 working days. For fixing and adjustments, the Commission shall not take account of daily import duties used for the previous fixing. The intervention price to be used for calculation of the duties shall be that of the month in which the import duty applies. 3. Import duties fixed as provided for in this Regulation shall be applicable until a new fixing comes into force. On the occasion of each fixing or adjustment the Commission shall publish in the Official Journal of the European Union the import duties and the data used for their calculation. on the Atlantic coast of the Iberian Peninsula, in the United Kingdom, in Ireland, in Denmark, in Estonia, in Latvia, in Lithuania, in Poland, in Finland and in Sweden and where the goods arrive via the Atlantic Ocean, the Commission shall reduce the import duty by EUR 2 per tonne. The customs authority at the port of unloading shall issue a certificate in accordance with the model given in Annex I attesting the quantity of each product unloaded. For the duty reduction provided for in the first subparagraph to be granted this must accompany the goods until completion of the customs import formalities. 1. Import duties shall be reduced by EUR 24 per tonne on flint maize meeting the specifications laid down in Annex II. 2. In order to benefit from the reduction provided for in paragraph 1, flint maize must be processed into a product of CN codes 1904 10 10, 1103 13 or 1104 23 within six months from the date of acceptance of entry for free circulation. 3. The end-use provisions of Article 82 of Regulation (EEC) No 2913/92 and Articles 291 to 300 of Commission Regulation (EC) No 2454/93 (5) shall apply. 4. Notwithstanding Article 293(1)(e) of Regulation (EEC) No 2454/93, the importer shall lodge with the competent authority an additional security of EUR 24 per tonne for flint maize, except where an import licence is accompanied by a certificate of conformity issued by the Argentine Servicio National de Sanidad y Calidad Agroalimentaria (Senasa) in accordance with Article 7(2)(a) of this Regulation. In such cases, the type of certificate of conformity and its number shall be entered in box 24 of the import licence application and the import licence itself. 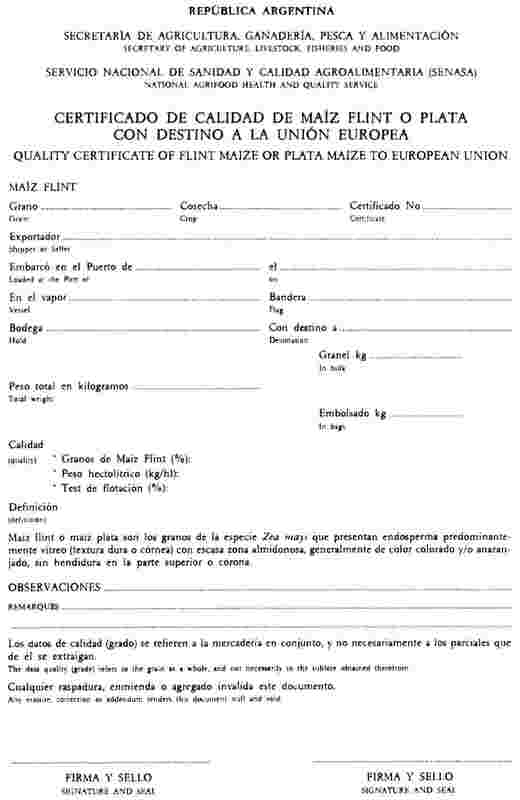 If, however, the duty applicable on the date of the acceptance of the declaration of release for free circulation is less than EUR 24 per tonne of maize, the security shall be equal to the duty amount. The quality standards to be met on importation into the Union and the tolerances allowed shall be those shown in Annex II. sea freight and associated costs between the United States of America (Gulf of Mexico or Duluth) and the port of Rotterdam for a vessel of at least 25 000 tonnes. components referred to in points (b) and (c) of paragraph 1 from publicly available information. discount of EUR 30 per tonne for low quality durum wheat. 4. The representative cif import prices for durum wheat, high quality common wheat and maize shall be the sum of the components referred to in points (a), (b) and (c) of paragraph 1. The representative cif import prices for rye and sorghum shall be calculated using the barley quotations in the United States of America in accordance with, the provisions of Annex III. 5. The representative cif import prices for common wheat seed of CN code 1001 90 91 and maize seed of CN code 1005 10 90 shall be those calculated for high quality common wheat and maize respectively. gives a written commitment to lodge with the relevant competent body on the date of acceptance of the declaration of release for free circulation a specific security additional to those provided for in Article 12 of Commission Regulation (EC) No 1342/2003 (6). The additional security referred to in point (b) of the first subparagraph, shall be EUR 95 per tonne. However, in cases where the import licence is to be accompanied by certificates of conformity issues by the Federal Grain Inspection Service (FGIS) and by the Canadian Grain Commission (CGC) in accordance with Article 7(2)(b) or (c), no additional security shall be required. In such cases, the type of certificate of conformity and its number shall be entered in box 24 of the import licence application and import licence itself. gives a written commitment to lodge with the relevant competent body on the date of acceptance of the declaration of release for free circulation a specific security additional to those provided for in Article 12 of Regulation (EC) No 1342/2003, if the import duty on the quality shown in box 20 of the import licence is not the highest duty for the product category in question. The amount of the additional security referred to in point (b) of the first subparagraph shall be the difference on the day of acceptance of the declaration of release for free circulation between the highest duty and that applicable to the quality shown, plus a supplement of EUR 5 per tonne. However, where the import duty applicable to the different qualities of durum wheat is zero, the commitment referred to in point (b) of the first subparagraph shall not be required. 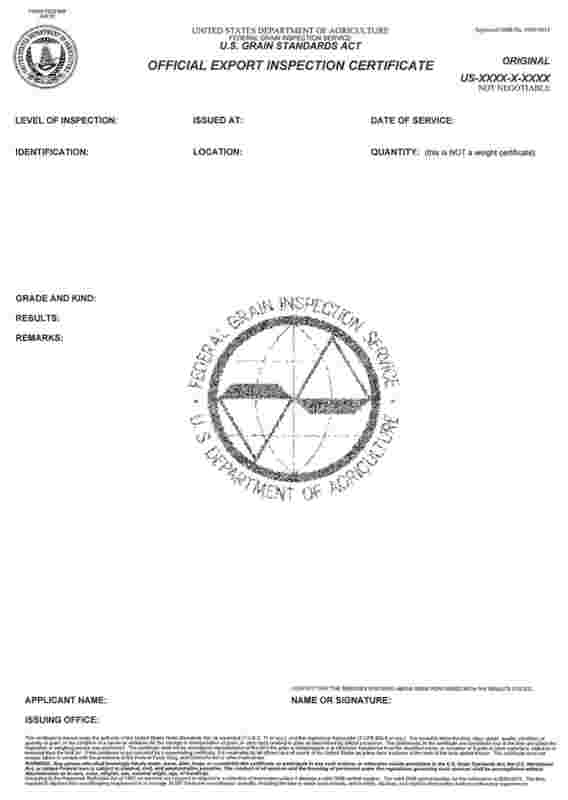 Where the import licence is to be accompanied by certificates of conformity issued by the Federal Grain Inspection Service (FGIS) and by the Canadian Grain Commission (CGC), in accordance with Article 7, no additional security shall be required. In this case, the import licence shall contain in box 24 the mention of the type of certificate of conformity. 3. Where customs duties for all quality categories of common wheat have been suspended under Article 187 of Regulation (EC) No 1234/2007, the additional security of EUR 95 per tonne referred to in paragraph 1 of this Article shall not be required for the entire period which the duties are suspended. 1. The customs office of release for free circulation shall take representative samples, in accordance with Annex I to Commission Regulation (EC) No 152/2009 (7), of every consignment of high quality common wheat, of durum wheat and of flint maize. However, sampling shall not take place where the import duty for the different qualities is the same. If, however, the Commission officially recognises a quality certificate for high quality common wheat, durum wheat or flint maize issued by the country of origin of the cereals, samples shall be taken for verification of the certified quality only from a sufficiently representative number of consignments. 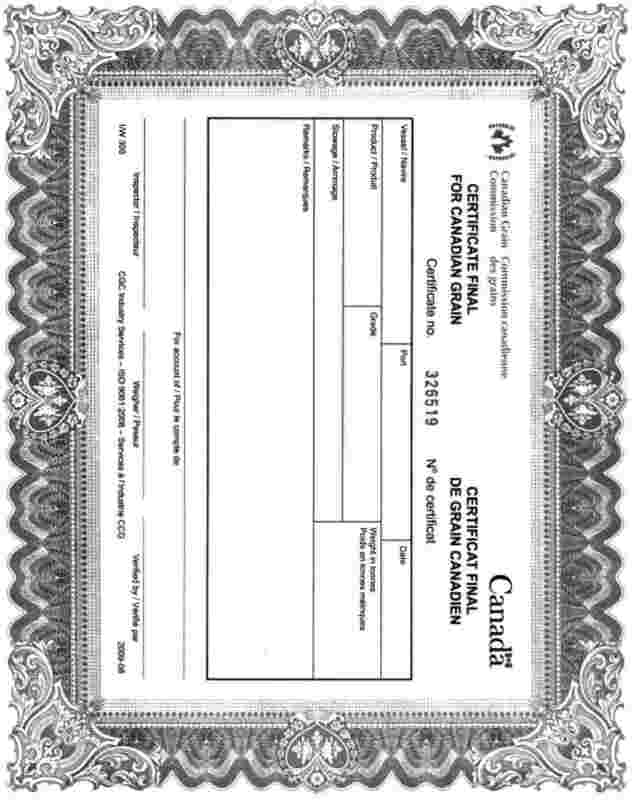 certificates issued by the Canadian Grain Commission (CGC) of Canada for high quality common wheat and high quality durum wheat. A blank specimen of the certificates of conformity issued by Senasa is given in Annex IV. Reproduction of the stamps authorised by the Argentine government shall be published in the Official Journal of the European Union. Blank specimens of the certificates of conformity and stamps issued by the FGIS are given in Annex V.
Blank specimens of the certificates of conformity, export specifications and stamps issued by the CGC are given in Annex VI. When the analytical parameters entered in the certificates of conformity issued by the entities referred to in the first subparagraph show conformity with the high quality common wheat, durum wheat and flint maize quality standards given in Annex II, samples shall be taken of at least 3 % of the cargoes arriving at each entry port during the marketing year. The goods shall be classed in the standard quality for which all the requirements indicated in Annex II are met. 3. The standard methods for the determinations referred to in paragraph 1 shall be those given in Commission Regulation (EU) No 1272/2009 (8). Flint maize is maize of the species Zea mays indurata the grains of which present a dominantly vitreous endosperm (hard or horny texture). They are generally orange or red. The upper part (opposite the germ), or crown, shows no fissure. when cut lengthwise their endosperm shows a central mealy part completely surrounded by a horny part. The horny part must account for the dominant part of the total cut surface. The vitreous grain percentage shall be established by counting in a representative sample of 100 grains the number meeting the criteria referred to in the third subparagraph. The reference method for determining the flotation index is given in Annex VII. 4. If the analysis results show the imported high quality common wheat, durum wheat and flint maize to be of a lower standard quality than entered on the import licence the importer shall pay the difference between the import duty applicable to the product shown on the licence and that on the product actually imported. In this case, the security for the import licence referred to in Article 12(a) of Regulation (EC) No 1342/2003 and the additional security provided for in Articles 3(4), and 6 (1) and (2) of this Regulation shall be released, except for the EUR 5 supplement provided for in the second subparagraph of that Article 6(2). If the difference referred to in the first subparagraph is not paid within one month, the additional security provided for in Article 3(4) and Article 6(1) and (2) shall be forfeit. 5. Representative samples of imported cereals taken by the competent authority of the Member State shall be retained for six months. Regulation (EC) No 1249/96 is repealed. References to the repealed Regulation shall be construed as references to this Regulation and shall be read in accordance with the correlation table in Annex IX. (2) OJ L 161, 29.6.1996, p. 125. (5) OJ L 253, 11.10.1993, p. 1. (6) OJ L 189, 29.7.2003, p. 12. (7) OJ L 54, 26.2.2009, p. 1. (8) OJ L 349, 29.12.2009, p. 1. (2) The methods of analysis provided for in Part IV of Annex I to Regulation (EU) No 1272/2009 are applicable. (1) Where no quotation is available that can be used to calculate a representative cif import price, fob quotations publicly available in the United States of America shall be used. (2) Where no quotation is available that can be used to calculate a representative cif import price, the most representative fob quotations publicly available in the United States of America shall be used. In these grades, include only oats, barley, rye and triticale. For common wheat exports, the Canadian Grain Commission will supply documentation with the certificate specifying the protein percentage for the cargo in question. For durum wheat exports, the Canadian Grain Commission will supply documentation with the certificate attesting to the vitreous kernel percentage and specific weight (kilograms/hectolitre) of the cargo in question. Prepare an aqueous solution of sodium nitrate of specific weight 1,25 and conserve it at 35 °C. Place in the solution 100 grains of maize from a representative sample of maximum moisture content 14,5 %. Shake the solution at 30 second intervals for five minutes to eliminate air bubbles. Separate the floating from the submerged grains and count them. The flotation index is the arithmetic mean for the five trials excluding the two extreme values. (OJ L 161, 29.6.1996, p. 125). (OJ L 98, 15.4.1997, p. 2). (OJ L 292, 25.10.1997, p. 10). (OJ L 315, 25.11.1998, p. 7). (OJ L 256, 10.10.2000, p. 13). (OJ L 283, 27.10.2001, p. 8). (OJ L 91, 6.4.2002, p. 9). (OJ L 287, 25.10.2002, p. 15). (OJ L 158, 27.6.2003, p. 12). (OJ L 123, 27.4.2004, p. 50). (OJ L 294, 1.11.2008, p. 3). (OJ L 139, 5.6.2009, p. 3). (OJ L 51, 2.3.2010, p. 8). (1) Regulation as amended by Regulation (EC) No 2015/2001 (OJ L 272, 13.10.2001, p. 31).